Everyone is limited to one spell card now. I like this change. It'll be like IaMP or SF4 Ultras (minus the new Ultra W). I could never figure out how spellcards worked in IaMP. I liked it better with SWR/Hisoutensoku. Looks like she's been taking lessons from Yukari! Well, I'm excited now. Can't wait to see exactly where they're going with the system. I'm still good with DDC and ISC these days, and a game like HM encourages expansion, which is a good thing. I like when he rolls with a theme through a couple games. I wonder if this will affect gameplay in any way. Maybe it's this games gimmick, like the weather in SWR and popularity in HM and whatnot. For those that have not seen it. Glad to see we are using HM sprites! They looked very good. -Score is back from IaMP, it's been mising since soku. 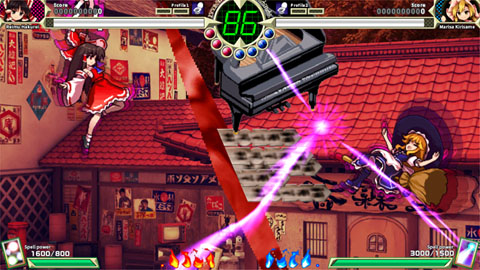 -Reimu is definitely using a portal to attack with a piano and grave makers, maybe she is using the "legends" to summon stuff? So... when's the who's gonna be in the game hype starts? I can't wait. I'd assume everyone from HM since they already have the resources. I also want to say (read: hoping for) Seija because of her recent relevance. If this is supposed to be the 20th anniversary game I'd guess some older characters, Sakuya, Yukari, Suika, etc. If it's not supposed to be something special I don't really know. Most of the important DDC characters would fit poorly in a fighter (Sukuna is the size of a thumb, Raiko has to lug around her drums). The setting looks identical to Kourindou, and the about the gap; wasn't Yukari teaching some stuff to Reimu after PCB, that explains Reimu's later SC with Boundary or Barrier Sign, like Duplex Danmaku Barrier and some tricks Reimu can do in-game. Wouldn't surprise me if they finally made a SC were Reimu can open a gap to throw some objects. I say Remilia could make it in. Would make way for vampire stuff, and then she has that pet chupacabra too, which could be mentioned with the whole 'Urban Legend' thing. I kind of want to say Sekibanki, and I'm not sure why. Rosalia and Luma type gameplay would probably fit her. I wonder if there'll be any characters other than Reimu and Marisa in the demo. Is this possibly the game Kasen finally becomes playable? I want to believe but...would she fit in? about the gap; wasn't Yukari teaching some stuff to Reimu after PCB, that explains Reimu's later SC with Boundary or Barrier Sign, like Duplex Danmaku Barrier and some tricks Reimu can do in-game. This just in Kasen is the new Mima. 14.8 will be a phantasmagoria game obvs. A guy who changes his profile picture constantly. Goodness, I'm incredibly hyped for this. I guess I'm in the minority of people that liked Hopeless Masquerade, and would actually like a sequel. Main games that I've cleared on Normal (1cc): EoSD, PCB, IN, PoFV, MoF, SA, TD, and DDC. Goal: Getting a normal 1cc on UFO. Did people really think they wouldn't ever make another HM sequel or something? Practically every fighting game in existance has had its assets re-used. Might as well save on the costs after all. Besides, as pointed out, it could (and probably will) play insanely different from HM anyways akin to SWR compared to IAMP. Not that that's necessarily a good thing, mind you, but at least it means things are up in the air rather than guaranteed to be bad! To be honest, anyone who hasn't been in any of the fighters (or at least Hopeless Masquerade) will do for me. I just want Nue, is it that much? You know, you people were talking about how weird the stages themselves look, and how the stage itself seems to be Kourindou, and I was reminded of Arcana Heart suddenly. Like in Arcana Heart, the stages themselves look normal at first, but after you activate certain super mode mechanism, the stages change to include all sort of weird stuff. So maybe this has a similar deal to it. I'm all for that gimick just so I can make a "I'M ON SHROOMS" or "I'M TRIPPIN BALLS MAN!" joke. Right so initially I was going to explode about how it's an HM sequel because I disliked HM for a variety of reasons but instead I'm going to try and keep my mind a bit more open until the demo itself actually drops. After all, Street Fighter 1 was garbage, but Street Fighter 2 pretty much invented the whole fighting game genre, right? First thing I'll say is the HUD looks like it's a lot simpler than in HM. There's no Shinto/Buddhist/Taoist mode, no popularity (unless that's what the orbs under the timer mean), no character-specific traits and only one spellcard. This in my opinion is a good thing, because I felt HM was awfully cluttered in terms of mechanics. With regards to the spell power bars, it looks like we may be going back to traditional super meters? Reimu's will presumably build faster but do less damage than Marisa's and so on. In terms of gameplay I think a big issue with HM was the movement was at odds with the fighting. Melee attacks in general didn't offer any useful mixup since the airborne nature of the game prevented high/lows. Bullets were rarely a threat because you had eight degrees of freedom and grazing was always useful - besides, most useful combo starters were melee attacks anyway. I guess where I'm going with this is that I think ULiL needs to find its own identity - if it wants to be an airborne fighter then it should make bullet attacks a lot stronger rather than focusing on a close combat game plan that the movement system really isn't designed for. Make it less of a traditional fighter and more along the lines of, say, Acceleration of Suguri. Another thing that really hurt HM was that it came out in a REALLY unfinished state. Game breaking bugs hung around for months and stuff that should have been available from day 1 (such as playable Kokoro) took forever to arrive. By then I had already dropped the game because it left a pretty horrid taste in my mouth. I'm hoping that since ULiL seems to use a lot of the same assets, Tasofro's used the time to give the system a lot more polish. Finally let's play Rou's favourite game: Let's Find Petty Reasons To Hope That The Newest Touhou Game Might Be Underwater! In this case I'm looking at the kanji for 'deep' which they snuck into the opening title. It'd also mean we could get playable Wakasagi and I would be all for that. tl;dr As long as it's not a rehash of HM and its flawed systems I'll give it a shot. Having learnt my lesson from the HM threads (that the thread quickly become impossible for any newcomer to follow), I'll be updating the OP with new information until the next major ULiL discussion thread is opened. The jewels under the time countdown should be the "Occult Balls" mentioned in the Digi Game Expo flyer. Some say the time clock somewhat resembles the Dragon Radar, in keeping with the Dragon Ball reference. Looks like some sort of advantage system; probably the player with more Occult Balls wins when countdown ends. This is also a return of the given name + family name order: "Reimu Hakurei", "Marisa Kirisame". Ah, good old pre-MoF days. given name + family name order:"Kirisame Marisa"
I think you made a mistake here. I'll just take a seat and watch people moan about another advantage system. Eh, I don't really care about that system. All I care about is the spell card system, and as long it is as easy to use as in HM, I'm happy. Someone please post all the pics? You are the first one to report this here. Where are you physically located? The thing about Twilight Frontier is, their site had for many years blocked the Chinese IP address band with a 403 Forbidden message. Their site used to be still accessible in Hong Kong and Taiwan. However, this time they've switched their blocking policy. Now the entirety of China, Taiwan and Hong Kong included, cannot access their site. Judging from your information, they've also blocked Southeast Asia? I did considered this, so I've posted the screenshot in the OP. Now that you've asked, I've added the two images from Tasofro's site. Enjoy!